First, a small thought piece: why art? One of the main reasons that we have narrative - certainly not the only one, but a big one - is to create an environment where we as a society can confront our anxieties. You see this in the common idea that all art reflects the culture in which it was created. As far as film goes, there are four main ways that this can be done, and this is what we call "genre": dramas are films where our anxieties are stated outright and analysed, action films are those in which we get to violently attack our anxieties, comedies mock our anxieties and give us power over them, and horror disguises our anxieties in clothes that allow us to work through our fears in a safe space. In the first decade of the third millennium, a fair argument can be made that the primary anxieties we are dealing with, certainly in the United States, are the random acts of arbitrary violence called terrorism, and humanity's destruction of our planet's environment. Both of those things have been looked at in plenty of films, but to the best of my uncertain knowledge, no one movie has tried to collect both of those ideas in one place. Until M. Night Shyamalan's The Happening, which is a horror film treatment of those two themes, trying to scare us into a place of higher knowledge of what we fear about terror attacks and the fate of our race on an Earth that we're doing our damnedest to turn into a wasteland. Now, if I were a generous man who gave out points just for good intentions, I suppose I'd think that The Happening was a pretty great movie, its wretched title notwithstanding. But appreciating art is a matter of how something is said as much as what has been said, and on that count, The Happening is a colossal disaster, very close to being Shyamalan's worst film yet, though nothing can quite compare to the Carroll-like delirium of Lady in the Water with its hodgepodge of scraps from fairy tales and made-up words. Such a wreck is the film, we've recently been treated to the sight of Shyamalan & Co. trying to pretend that it was a deliberate B-movie, perhaps even a black comedy, to which I reply: balls. The Happening was never meant to be anything but a very serious, thoughtful argument that has never been made in such detail or with such care, as attested to by the director's trademarked hushes and portentous camera angles on things like... but I must not give away the secret. Here's the set-up, and it's actually pretty okay: all of a sudden, people in New England are getting hit with an airborne disease whose three symptoms are confused speech, brief immobility, and suicidal behavior. Nobody knows what's going on, but the obvious first assumption is that it's some insidious form of bio-terrorism. Cut to Mark Wahlberg, as Elliott Moore, an elementary school science teacher in Shyamalan's beloved Philadelphia. He is introduced in the worst moment in a film with some pretty heavy competition for that title, a nifty little bit where the director tips his hand that no matter what the script says, this is really another "Goddidit!" film like Signs: our hero the science teacher informs his class that Good Science is about throwing up your hands and admitting that there are some things that Man Was Not Meant To Know. Or as Shyamalan puts his dressed-up Creationism: "Science will come up with some reason to put in the books, but in the end it'll be just a theory. I mean, we will fail to acknowledge that there are forces at work beyond our understanding. To be a scientist, you must have a respectful awe for the laws of nature." Anyway, all of Philadelphia evacuates into the countryside, where nobody has yet been taken with the sickness, although we in the audience are not surprised to find that it follows them along. Joining Elliot are his wife Alma (Zooey Deschanel), his friend Julian (John Leguizamo), and Julian's daughter Jess (Ashlyn Sanchez). Elliot and Alma have been having unspecified marital problems lately (and I must give points to the filmmaker for this rare note of subtlety), so things are kind of unpleasant at first, but as all the people they hook up with drop off like flies, they just kind of forgive each other. The plot's a bit hard to recap, honestly, because there's not really much plot. 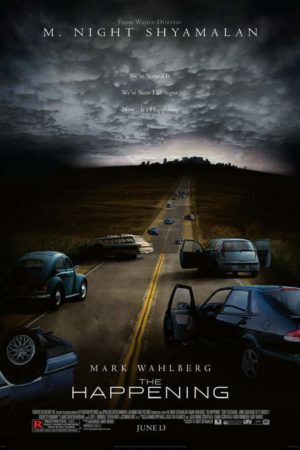 The Happening has a touch of the zombie movie to it, in a way: almost all of the second act consists of people traipsing cross-country, doing what they can to find a safe haven as death reigns. Early in this voyage, they come across a crazy old botanist (Frank Collison) who is convinced that what's happening is that all the Earth's plants are releasing a toxin into the air to kill us for our planet-destroying ways. So for most of the film, as everyone else sees terrorists hiding everywhere, Elliot grows more and more certain that all the trees and grasses are out to murder him. Spoiler: he is right. Setting aside how amazingly ludicrous this mid-movie revelation is, what pushes The Happening into far-out Bad Movie Land is Shyamalan's remarkable incompetence at filming it. It was not even ten years ago that he was being breathlessly proclaimed "The Next Spielberg," and while I tend to think that even The Sixth Sense - a pretty terrific ghost movie - is more derivative than creative, still I was unprepared for the incredible shabbiness of the director's visual language on display here. Only two points leap out as being especially well-crafted: a brilliant, unnerving scene where the men in a construction site are horrified as the workers on the top floor start plummeting to the ground, and a foot-level tracking shot of several people killing themselves with the same pistol. Otherwise, the order of the day is a nearly uncountable number of underlit shots of wind blowing threateningly through the treetops (leading to a new rule: wind cannot be made scary), and almost as many inexplicable close-ups, particularly on Deschanel, who is introduced in one of the most unpleasant shots in which the actress has ever appeared: her giant eyes fill the screen and she looks like a coke fiend. That's to say nothing of the mere incompetence of scenes like the one where Julian leaves his friends to go look for his wife: opening with him leaning into a car, telling Elliot that he has to leave right now, and then three or four minutes of solid dialogue follow, and it's only after Julian walks towards the car that it starts to pull away. The film's treatment of the post-9/11 mindset is a visual and narrative wreck, too. Earlier this year, we got the distinctly flawed Cloverfield, which nevertheless produced some uncomfortably perfect visual quotations of the WTC footage. Except for that construction site scene, The Happening is notably missing anything that really evokes 9/11 - or indeed, of anything that might be even a little bit disturbing. For all the hoopla about "M. Night Shyamalan's first R-rated film evar!" he spends a lot of time running away from R-rated imagery. If it weren't enough that it was poorly-made (The Happening really is one of those hilariously bad movies that keeps on giving: if it's not the plot it's the dialogue, and if not the dialogue than the direction, and...), Wahlberg and Deschanel give the worst performances of their respective careers: I assume because neither found much to inspire them in the script. Wahlberg has exactly one look in the entire movie, a frustrated brow-furrowing that gives him inch-deep crevasses in his forehead; Deschanel has a bit more range, from coked-out paranoiac to absent-minded optimism, but she stumbles over nearly every line, and at all times her eyes are unfocused. The only good performance, and it's actually pretty great, is Betty Buckley as Mrs. Jones, the crazy survivalist lady that the gang meet late in the film. Her role serves no purpose whatsoever to the narrative besides pushing it past 90 minutes, but at least she really tears into the looming psycho possibilities of the part. The emperor lost his clothes awhile ago, but with The Happening, I do wonder if Shyamalan has passed the point where his career can be saved: everything prior to Lady in the Water at least looked good, whereas here the best Tak Fujimoto can handle - a cinematographer who should have been able to knock this material out of the park - is to make the threatening shots of wavy grass not look completely stupid. Other than its ripe possibility for mockery, I cannot think of anything that makes the film really worthwhile: it takes a rich conceit and drives into the ground with idiocy and incompetence. Shyamalan can only wish it were a parody.